Those who know me know that I’m not from the people who know and love to rest and chill. The emphasis is on the ‘know’. I usually can’t sit and watch television unless something on TV engages me, I can not lie and ‘think’, I’m just no good at aimless surfing… So the other night I was alone at home, my sweets was out of town, and I had a plan to chill a bit. It didn’t work. I sat down, sent a couple of text messages, called my mom … and then I had nothing to do. Within 3 minutes I was thinking about what I could bake and what I feel like eating :) Pavlova! 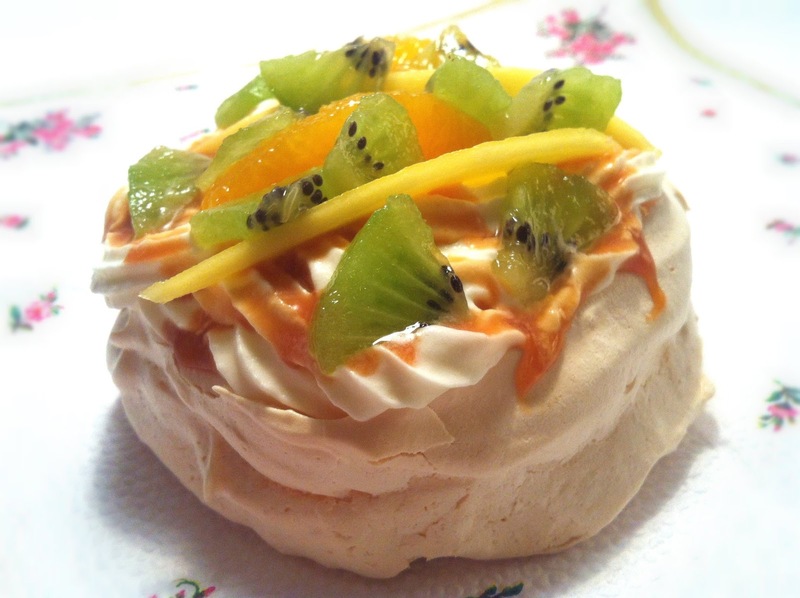 As I was alone, it didn’t make sense to do the whole so I made a mini Pavlova – and it turned out great! Pavlova dessert is normally native to Australia and New Zealand, and was named after the Russian ballerina of the early century, Anna Pauline. Read more here. Pavlova is characterized by a rich, crisp on the outside and soft inside marengue, and a light cream with fruit stacked on top. Refreshing and light, yet very sweet, it will satisfy the appetites of most dessert lovers. Usually, it is the size of a normal cake and cut as a cake, but th mini version is so cute and just as simple to make. Preheat the oven to 130 ° C, and the line baking pan with baking paper. Whip the egg whites to soft peaks, and then little by little add the sugar and mix until you get a nice, shiny and firm marengue. Then gently fold in the cornstarch, making sure to keep the marengue fluffy. On the back side of the baking paper draw (if you want), four circles of 8 cm, turn the paper and gently shape marengue circles of 3-4 cm height. It would be wise to leave a small It would have to chose a middle of each cakes leave a small dent in the middle - you will put the cream inside it. Bake for about 40 minutes and leave in an open oven to cool (or they will fall). Mix the cream and the cream fix in a high bowl. When it starts to get firm, add the vanilla sugar and vanilla extract. Blend until you get a nice, firm cream. Use a spoon or a confectioners bag to pipe the cream on top of each cake. Arrange the cut fruit on top the cream. You can use any soft, ripe fruit - I used kiwi, oranges and mangoes. I also poured the cream first with caramel sauce (see here how it is made), but you can skip this. You can enjoy the cakes immediately or save them fot later - but in this case, it is better to put the cream and fruit right before you plan to eat the cake. Enjoy!